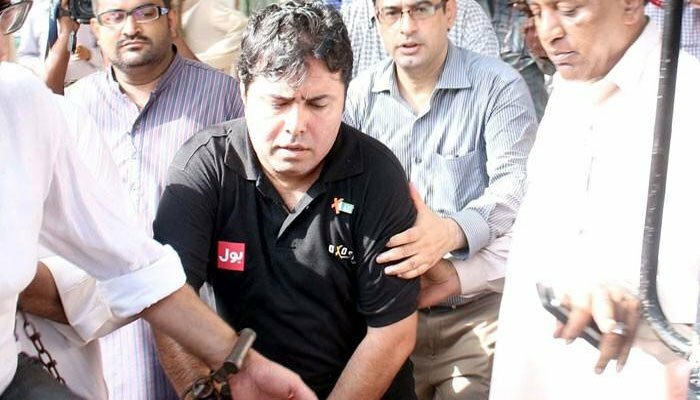 ISLAMABAD: Axact CEO Shoaib Sheikh is among 23 others sentenced by a district and sessions court to seven years in prison in the Axact fake degree scandal case. District and Sessions Judge Chaudhry Mumtaz Hussain Thursday announced the verdict on the conclusion of the hearing of the case. Sheikh and others were sentenced to 3 years each under sections 419 and 420 of Pakistan Penal Code, and fined Rs0.3 million each. They were also sentenced to 7 years each under sections 468 and 471, and fined Rs1 million each. All penalties will be applied together. The court also acquitted three accused, including Aisha Shoaib Sheikh. The trial court judge had earlier acquitted Axact CEO and other accused in the case. Additional district and sessions judge Pervaiz-ul-Qadir Memon had confessed to receiving Rs5 million for acquitting Shoaib Sheikh in the case. The Axact scandal surfaced in May 2015, when The New York Times published a report claiming the company sold fake diplomas and degrees online through hundreds of fictitious schools, making “tens of millions of dollars annually”. The Supreme Court, hearing the suo motu notice of the Axact scandal on February 9 this year, had ordered the Islamabad and Sindh high courts to wrap up the appeals against the suspects’ acquittal within weeks. The Federal Investigation Agency (FIA) had also filed an appeal with the Islamabad High Court against the trial court’s order acquitting all the accused in the case. The IHC had then declared the acquittal of Axact CEO Shoaib Sheikh and others void. It had ordered the sessions court to against listen to the final arguments and announce a verdict in the case. The issue came to the fore in 2015 when The New York Times published an article, claiming Axact sold fake degrees online through hundreds of fictitious schools. After the issue surfaced, the offices of the company were sealed and its chief executive officer and other officials were arrested. A senior manager of the company, Umair Hamid, was sentenced to 21 months in a US prison in August 2017 for his part in Axact’s fraud. Hamid, an executive of Axact, was arrested on Dec 19, 2016, according to a statement by former Manhattan US Attorney Preet Bharara. He was produced in a federal court in Fort Mitchell, Kentucky, the following day. According to the department of justice, Hamid was involved in running a “massive diploma mill” through Axact. The mill tricked people from across the world into enrolling in supposed high schools, colleges, and universities. “Consumers paid upfront fees, believing that in return they would be enrolled in real educational courses and, eventually, receive legitimate degrees. Instead, consumers received no instruction and worthless diplomas,” the website said.